Over the past few weeks I've been focusing my weekend ramblings to coastal beaches and marshes. The South-bound migration has begun for some shorebirds and seabirds, so I've been checking out Coney Island, Dead Horse Bay, Floyd Bennett Field, Gerritsen Creek, Jamaica Bay Wildlife Refuge and Plum Beach. Many species of shorebirds and terns are long-distance migrants, so it isn't unusual to see mixed flocks of these birds in July along the coast, especially at the refuge. 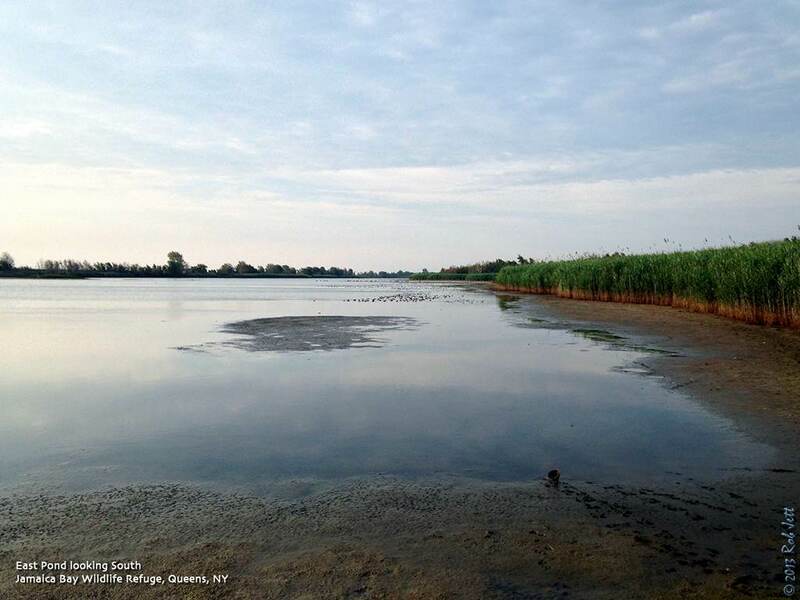 The refuge's West Pond was breached during Hurricane Sandy and is now a tidal saltwater cove rather than a freshwater pond. To access the Western side of the "pond" it is now necessary to walk counter-clockwise through the gardens towards Pumpkin Patch Marsh. A couple of visits to Plum Beach weren't very productive, although it was great getting there at first light and listening to all the terns, Laughing Gulls, Willets, Killdeer and some grousing Clapper Rails. This spot is also very good for finding marsh sparrows, in particular, Saltmarsh and Seaside Sparrows. To observe shorebirds here, it is best to visit at low-tide, when the flats are exposed for foraging birds. If low-tide is late in the morning (or the afternoon), human activity chases the birds away. On my last two early morning visits, there wasn't much shorebird activity yet. I did manage to find a Seaside Sparrow at the marsh side of the dunes here. Calvert Vaux Park, Coney Island Creek Park and Coney Island were also regular spots on my agenda as I searched for shorebirds, terns, gulls and any unusual coastal birds. 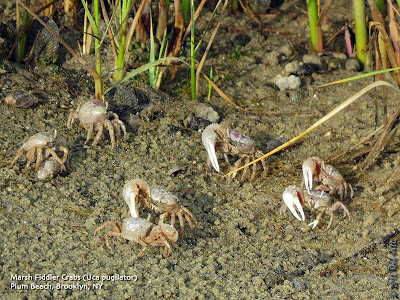 I had hoped that large areas of open grass at Calvert Vaux Park would attract some "grasspipers". Grasspipers are, technically, shorebirds, but prefer grassland habitats. Upland Sandpiper and American Golden-Plover are two species in that category that I was optimistic might show up at Calvert Vaux. This park also has the added benefit of being surrounded by water, increasing the possibility of locating some migrating shorebirds or seabirds. The only shorebirds seen in the past couple of weeks were Semipalmated Sandpiper and Spotted Sandpiper. 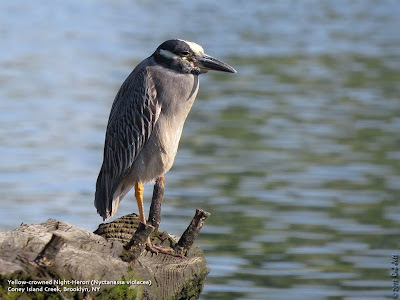 In addition, there were plenty of sleepy Black-crowed and Yellow-crowned Night-Herons hanging around the edges of the coves and on the relics of several sunken wooden barges. The Northern end of Dead Horse Bay isn't easy to access. One way is to start at Marine Park, walk the entire East shore of Gerritsen Creek and pass through a tunnel under the parkway. The other is to walk from Plum Beach, over the bridge, then down a steep, sandy path to the water. Either way requires a bit of walking, but it brings you to a small, tidal pond in the phragmites opposite the Flatbush Marina. I discovered this spot over the Winter after noticing it on Google Earth's satellite images. 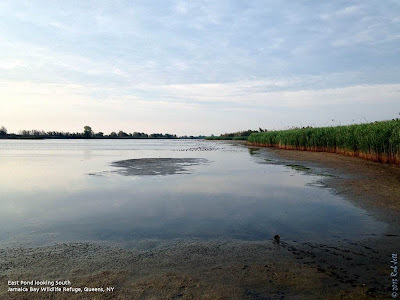 It seemed like it could have potential for attracting marsh sparrows, wading birds and shorebirds, especially since there is little or no human disturbance in this area. On my most recent visit to this area I didn't spot anything unusual, but there was a family of oystercatchers hanging around. Given the lack of humans along this stretch of shore, they most likely nested here. One odd sighting was of a non-breeding plumage Common Loon. During the Summer months this bird should be in breeding plumage. Other than this delayed molt, the bird seemed healthy and spent most of its time preening close to the shore. At one point it actually rested on the shore. Loons legs are very far back on their body to make it easier to chase fish underwater. The downside is that it makes walking on land nearly impossible, so he never strayed far from the water's edge. Strangely, early August of last year Heydi and I observed another Common Loon in non-breeding plumage at Dead Horse Bay. Maybe it's something in the water. 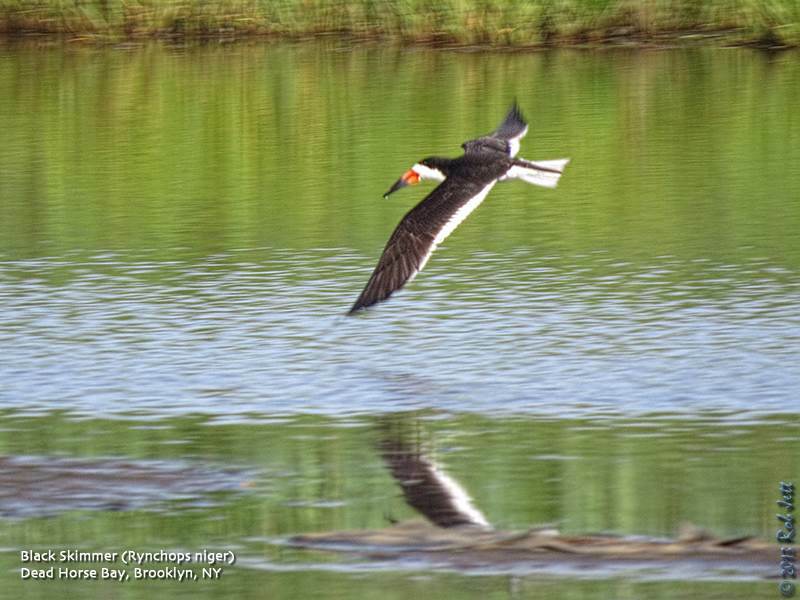 Jamaica Bay Wildlife Refuge really is THE place to go birding around New York in late-July and August. During high-tide, when the bay floods the mudflats (and the bird's feeding grounds), thousands of shorebirds move to the shallow waters and muddy shoreline of the refuge's East Pond. Normally the National Park Service rangers need to open a valve at the Northeast corner of the pond, draining thousands of gallons of water into Grassy Bay and lowering the water level for the birds. This Summer's heatwaves, however, seemed to have lowered the water naturally through evaporation, making the pond's edges passable for birders relatively early in the season - rubber boots are still recommended, though. Shorebird diversity is still relatively low, with Short-billed Dowitchers and Semipalmated Sandpipers dominating the feeding frenzy. This past Saturday I spent a couple of hours on the East Pond with Bob and Heydi. The highlight was great looks at a Ruff. This rare Eurasian species seems to be showing up at the refuge now every year and this was the second individual in as many weeks. Andrew Baksh wrote about it on his blog, Birding Dude. Perhaps in my lifetime they'll eventually expand their range to include North America...it's a nice dream since they are an incredible looking bird in breeding plumage. After I left on Saturday an American Avocet was discovered on the South Flats of the East Pond. It apparently only stayed for the day as it wasn't relocated on Sunday. One other interesting observation at the refuge was that some of the terns hanging around the pond were very young birds. They appeared to be part of family units and frequently chased the adults, begging for food. Over the next few weeks I expect to see the number and diversity of birds at Jamaica Bay Wildlife Refuge and other coastal areas increase substantially. Sundays, June 2 through August 11 South Street Seaport, Pier 17 7–8:30pm (Brother Islands; Hoffman and Swinburne Islands) 6-9pm (Jamaica Bay) Guide: Gabriel Willow With New York Water Taxi Meet at South Street Seaport's Pier 17. This summer we will once again be exploring the City's island rookeries with three different itineraries! Depending on which weekend you choose, cruises may visit the fascinating Brother Islands, the large egret and cormorant colonies on Hoffman and Swinburne Islands, or the great expanses of Jamaica Bay. Whichever your destination, you'll experience the wonders of New York's famous harbor at sunset and see some of the three thousand herons, egrets, and ibis nesting on these urban island treasures. Specific cruise dates and registration will be available soon. Limited to 90. Pricing varies by destination. To learn about specific cruise dates and buy tickets, visit www.nywatertaxi.com/tours/audubon or call 212-742-1969. Learn the secrets of insect-hunting in Brooklyn Bridge Park with Julie Feinstein, author of the Field Guide to Urban Wildlife. 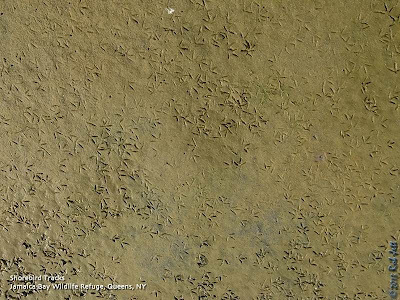 Discover one of New York City's endangered species -- the Piping Plover! There will be games, crafts, and giveaways! Greetings. 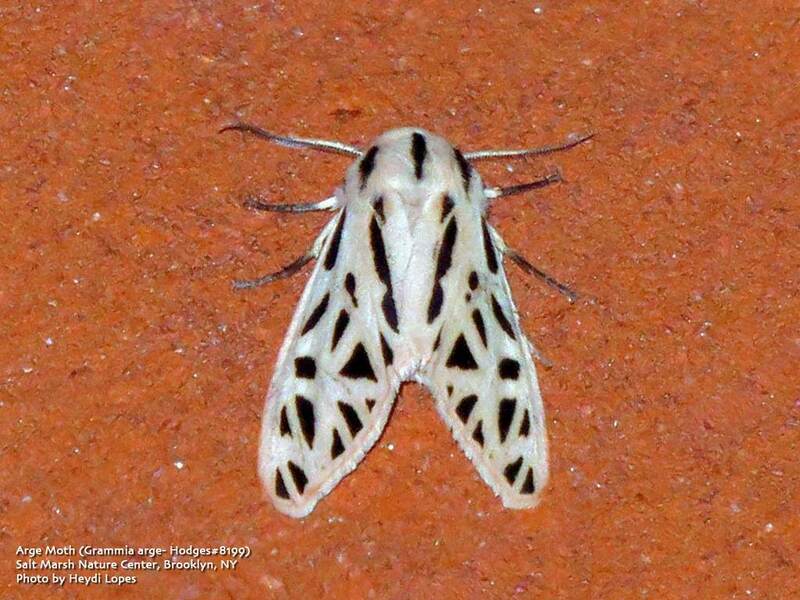 This is the New York Rare Bird Alert for Friday, July 26th 2013 at 9:15pm. The highlights of today's tape are MANX SHEARWATER, BROWN PELICAN, AMERICAN AVOCET, BAIRD'S SANDPIPER, RUFF and SANDWICH TERN. A pelagic trip out of Montauk last Sunday came up with an impressive list of marine birds and mammals consisting of 105 CORY'S SHEARWATERS, 18 GREAT SHEARWATERS, 5 MANX SHEARWATERS, 26 SOOTY SHEARWATERS, 1700 WILSON'S STORM-PETRELS, 5 BROWN PELICANS, 600 Common Dolphins, 25 Fin Whales, 12 Humpback Whales and 2 Minke Whales. An AMERICAN AVOCET appeared Sunday at Meadow Lake Flushing Meadows-Corona Park in Queens along with 4 PECTORAL SANDPIPERS and 2 WESTERN SANDPIPERS. At Jamaica Bay this week the numbers of birds decreased from last week's great numbers to much lesser numbers by Friday. Birding efforts were also hindered by PEREGRINE FALCONS hunting in the area of the East Pond. 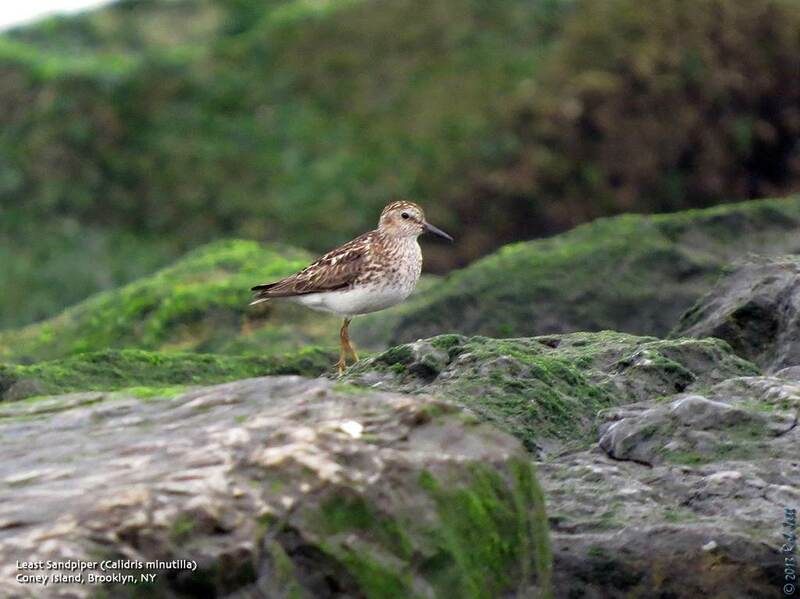 The previous reported RUFF at the East Pond was last seen on Saturday and Sunday and a BAIRD'S SANDPIPER, a highly uncommon bird at the East Pond, was found on Saturday and again seen on Sunday. 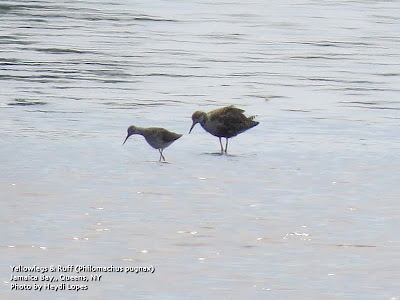 STILT SANDPIPERS were in good numbers at the East Pond with 54 on Sunday and 29 on Tuesday when a "Western" WILLET, 3 WESTERN SANDPIPERS and a WHITE-RUMPED SANDPIPER was also reported. A LONG-BILLED DOWITCHER, a WHITE-RUMPED SANDPIPER and a WESTERN SANDPIPER were seen at the East Pond on Thursday along with 7 species of heron including LITTLE BLUE HERON and YELLOW-CROWNED NIGHT-HERON. We have 2 reports of SANDWICH TERNS last week: one seen Saturday at Mecox Bay along with 3 ROYAL TERNS and another bird Wednesday at the overlook area at West Hampton Dunes. Another later sighting at the nearby Moriches Inlet flats was presumably the West Hampton Dunes bird. Sixteen ROYAL TERNS and 3 BLACK TERNS were seen Wednesday at the overlook area at West Hampton Dunes. Eight COMMON EIDERS were seen at the Shinnecock Inlet area last Saturday. A LEAST BITTERN was found today at Old Place Creek area in Staten Island. A CAPE MAY WARBLER was reported today from Little Alley Pond at Alley Pond Park in Queens. 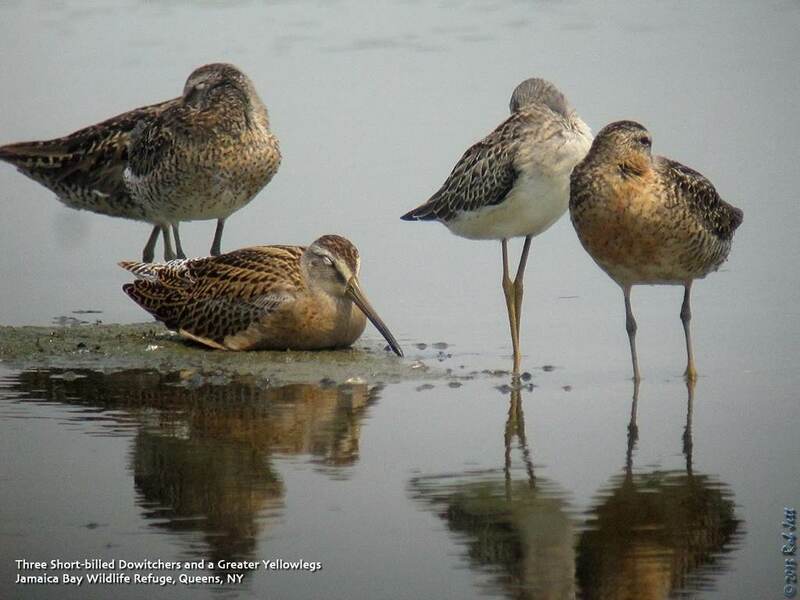 It's shorebird season and around NYC there is no better place to observe this diverse group of birds than Jamaica Bay Wildlife Refuge. Currently, the most common species feeding in the shallow waters of the East Pond is the Short-billed Dowitcher. Nesting in bogs and wet meadows of the boreal forests of northern Canada and Alaska, this large shorebird winters along the coasts of California and Virginia, southward along the Gulf Coast and as far south as Brazil. Their characteristic up-down jabbing motion while feeding is commonly referred to as the "sewing machine" behavior. I've just updated the "Books & Media" page to include smartphone apps. The new section in the contents to the right is now called "Books, Media & Apps". Below is the list of apps that I think are really helpful when in the field. The descriptions are from the manufacturers webpages. Note that I've focused on iPhone apps, however, many of them also exist for the Android operating system. Let me know if you have any recommendations that aren't included on the list. The award-winning Audubon Birds field guide with 820 species, gallery view for easy search, Find Birds powered by eBird, and NatureShare - a new community where birders can observe, identify, and share their observations and photos. iBird Pro Guide to Birds is designed to satisfy the demanding needs of advanced birders and professional naturalists. It offers comprehensive identification, behavior, habitat and ecology information, twice as many search attributes as iBird Plus Guide to Birds, hand-drawn illustrations, professional photographs, range maps, and playable calls for 926 North American and Hawaiian bird species. National Geographic presents an innovative, beautiful, and interactive field guide to the birds of North America with a new offering for iPhone/iPod touch. Whether you are new to bird-watching or already an expert, this completely updated and redesigned app makes spotting, identifying, and understanding birds easier than ever before. From its detailed illustrations to its easy-to-use interface, this is the one-stop resource you need to identify and track every bird you see. The official Peterson app for iPhone, iPod touch and iPad. Peterson Birds gives you illustrations, birds songs, range maps, and nest photos for over 800 species of North American birds on your on your iPhone, iPod touch, and iPad. More detail than any other mobile bird guide, with information from 8 Peterson Field Guide books, including the best-selling guide to birds in print, Peterson Field Guide to Birds of North America. For nature lovers on a budget, Peterson Birds Pocket Edition packs in a lot of detail for a small price. With over 800 species of North American birds from the best-selling book, Peterson Field Guide to Birds of North America, the app features Roger Tory Peterson's breathtakingly beautiful illustrations, range maps, species details, bird songs, and more. Now you can carry the full content of Peterson's field guide to birds of North America book in your pocket, wherever you go. The most popular printed field guide to North American birds is now available in its entirety on the iPhone and iPad! We have taken the simplicity and ease-of-use that you have enjoyed on your iPhone/iPod Touch and expanded and redesigned the layout (not simply “stretching” it) to take full advantage of the larger screen area of the iPad while still being the same app that runs on the iPhone/iPod Touch. BirdTunes provides bird enthusiasts with rapid, uncluttered access to a comprehensive collection of North American bird songs and calls. •Encyclopedic coverage, including over 2400 tracks for 674 species—over 10 hours of high fidelity sound. **If you use BirdTunes (or any song playback) in the field, please do so responsibly. We recommend the American Birding Association’s Code of Ethics, particularly section 1(b), for guidance. The most comprehensive plant guide on iPhone! Enjoyed by thousands of gardeners and landscape professionals world-wide, Landscaper's Companion is the #1 reference guide to all plants including trees, shrubs, annuals, and perennials. Containing information on over 26,000 plants and 21,000 pictures, Landscaper's Companion makes an excellent resource for the casual gardener, professional landscaper, aspiring botanist, or anyone looking for a simple, easy to use plant guide. MyNature Trees of North America is now available for the iPhone and iPod touch. We are pleased to offer one of the first comprehensive field guides to Tree identification available with smart-phone technology. You will be able to identify over 190 trees with leaves or needles from Maine to California as well the Canadian Provinces with a touch the screen all in the palm of your hand. Audubon Butterflies features 627 butterflies of the U.S. and Canada. This guide contains in-depth, authoritative information based on the National Audubon Society’s "Field Guides to Butterflies," with updates by Rick Cech, a natural history author and one of the world's leading butterfly experts. The indispensable reference for over 500 insects and spiders. Featuring comprehensive photos and in-depth descriptions. Audubon Insects and Spiders is your introduction to the most common species of insects and spiders in North America. Created in affiliation with the National Audubon Society, this app features in-depth information on 509 species with high-quality photos. 1. What does the bird look like? 2. What does the bird sound like? 3. Should it be here at this time of year? Be a birder who can Identify birds by their songs. This app will teach you to recognize up to 371 species by their calls. It's an electronic flip card game with real calls and songs of North American birds. Includes 371 species of North American song birds each with high quality songs from Cornell Laboratory of Ornithology. A complete, game-based learning system for mastering bird sounds—designed for both beginners and advanced birders. BirdLog is the first and only mobile data app for quickly and easily recording and submitting your sightings directly into eBird from the field! Forget about notebooks, pencils and sitting at your computer. Transform your bird sightings into eBird submissions to build your own lists while sharing your sightings and supporting conservation. Saturday, July 27, 2013, 9:00 a.m. to 4:00 p.m.
Join us for our first summer 10-mile walk of the Greenbelt. We will walk 10 moderate miles, although it may be shortened if there is an ozone alert day. Meet at the Greenbelt Nature Center on Rockland Avenue at Brielle Avenue. Bring lunch and ample beverage. For more details call Dominick Durso at 917-478-7607. Hike East Pond to view migrating shorebirds and butterflies. Greetings. 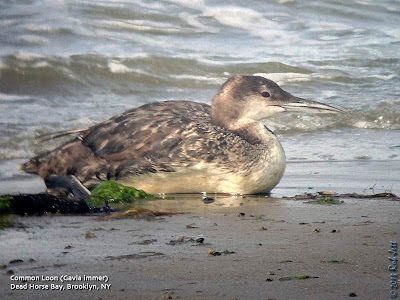 This is the New York Rare Bird Alert for Friday, July 19th, at 8:00pm. The highlights are LEACH'S STORM-PETREL, RUFF, ARCTIC TERN, SANDWICH TERN, and LONG-TAILED JAEGER. A LEACH'S STORM-PETREL was discovered on a pelagic trip off the south shore of Long Island last Sunday. 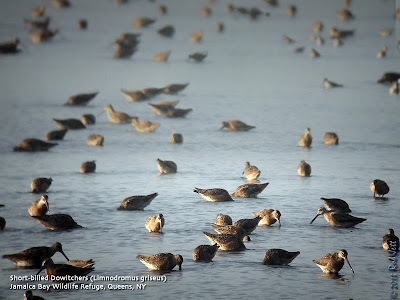 Approximately 5000 shorebirds were counted this morning at the East Pond of Jamaica Bay, highlighted by a RUFF (first seen near the south end, then later near Dead Man's Cove on the west side of the north end), 3200 SHORT-BILLED DOWITCHERS, 1500 SEMIPALMATED SANDPIPERS, 130 LEAST SANDPIPERS, 110 LESSER YELLOWLEGS, 30 SEMIPALMATED PLOVERS, 27 GREATER YELLOWLEGS, 24 STILT SANDPIPERS, 8 AMERICAN OYSTERCATCHERS, and one PECTORAL SANDPIPER. 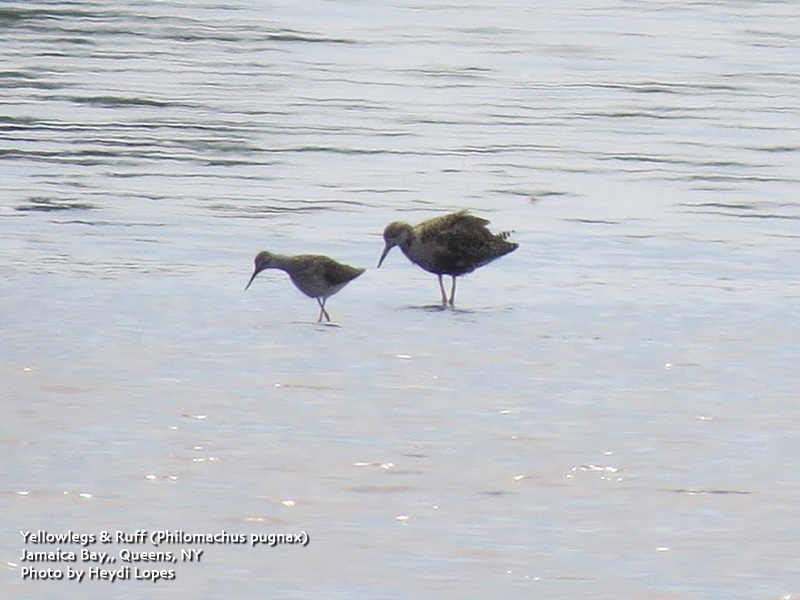 The RUFF was still present on the East Pond at 2:30 this afternoon (east side of north end), and a WESTERN SANDPIPER was also reported there. Access to the East Pond has improved, but boots are still recommended. Wednesday's count from the East Pond at the end of the day tallied 2000 shorebirds that were mostly SHORT-BILLED DOWITCHERS and SEMIPALMATED SANDPIPERS but also included a WHITE-RUMPED SANDPIPER, a LONG-BILLED DOWITCHER and 6 STILT SANDPIPERS. An ARCTIC TERN was found last Wednesday at Cupsogue County Park in West Hampton Dunes. A SANDWICH TERN, a ROYAL TERN, and a ROSEATE TERN, plus a LONG-TAILED JAEGER were also found last Saturday at Mecox Bay. A LESSER BLACK-BACKED GULL appeared last Saturday at Sagaponack Pond, and the ocean at nearby Georgica Pond produced a few WILSON'S STORM-PETRELS and a CORY'S SHEARWATER. A pelagic trip off Montauk Point last Sunday led to the discovery of ~500 GREAT SHEARWATERS, ~200 CORY'S SHEARWATERS, ~50 SOOTY SHEARWATERS and ~12 WILSON'S STORM-PETRELS. Also seen were ~8 Fin Whales, ~60 Common Dolphins and 2 LOGGERHEAD TURTLES. A SNOW GOOSE continues this week with Canadas near the Lemon Creek Boat Launch on Staten Island. It was first reported in the spring and appears to have an injured wing. A YELLOW-THROATED VIREO was at Alley Pond Park last Tuesday. 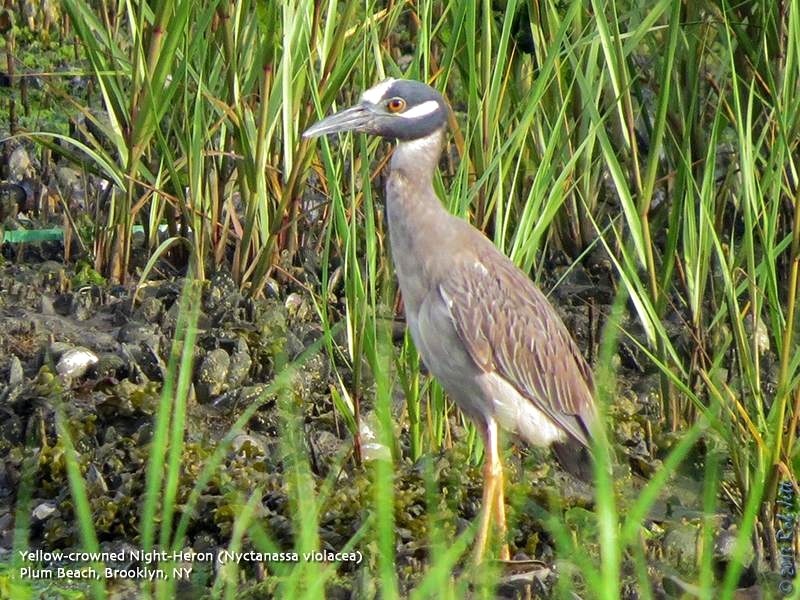 A BLACK-BILLED CUCKOO was at Jamaica Bay on Thursday., and a LOUISIANA WATERTHRUSH was seen in Rocky Point today. Tom Burke will be away for the next two weeks. Please call in reports to Tony Lauro at (631) 734-4126. As of today, I've removed the sidebar sections of recommended reading/media and added a dedicated page for "Books and Media". If you have any birding or nature publications you'd like me to add to the list, just drop me a note through the comments section. Note that some of the publications may seem outdated, but the material within is timeless. Over the weekend I'll also be adding recommended smartphone apps to that section. 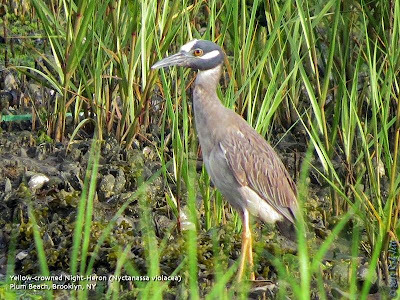 Feeding primarily on crustaceans, this Yellow-crowned Night-Heron was seen at Brooklyn's Plum Beach, where fiddler crabs are abundant. 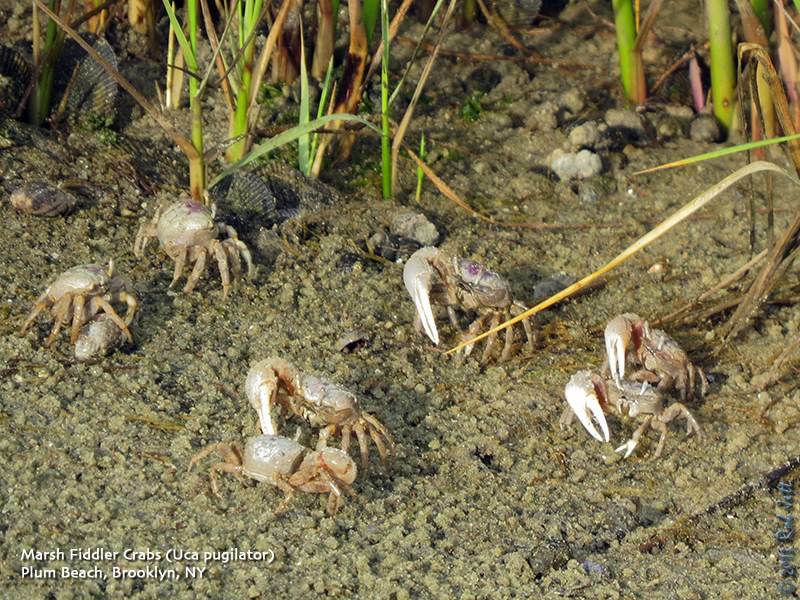 New York City and Long Island are at the Northern-most edge of this specie's breeding range. The first nesting Yellow-crowned Night-Herons in New York State were reported in Massapequa, Nassau County in 1938 by naturalist and photographer Allan D. Cruickshank.Though this specie's conservation status is listed as "Least Concern", its reliance on coastal wetland habitats make it vulnerable in many populated areas, such as New York. Pollution of the world's oceans by plastic debris has spawned a new ecosystem - "The Plastisphere". The masses of plastic debris that float over large areas of the world's oceans have become new ecological communities that scientists have named the "Plastisphere." Their report in the ACS journal Environmental Science & Technology suggests that these novel habitats in the North Atlantic Ocean may harbor potential disease-causing microbes. They discovered that tiny organisms from algae to bacteria thrive on plastic debris, transforming it into rich “microbial reefs” that are distinct from communities in surrounding water. Though some inhabitants may be degrading the plastic, it still provides a relatively stable home for microbes. Apparently a good home for its little residents, plastic debris might pose a health risk for invertebrates, fish or possibly humans. The Plastisphere harbors a group of bacteria called Vibrio. Some Vibrio species can cause illnesses, such as cholera, when they come in contact with humans. Chipping Sparrows migrate through New York City in extremely large numbers. Several years ago Doug Gochfeld, Marge Raymond and myself observed a single flock in Green-Wood Cemetery that we estimated at around 20,000 individuals. During the breeding season they are relatively scarce in Brooklyn, with Green-Wood Cemetery being the best place to find them as they nest in conifers (Green-Wood has many healthy evergreens). 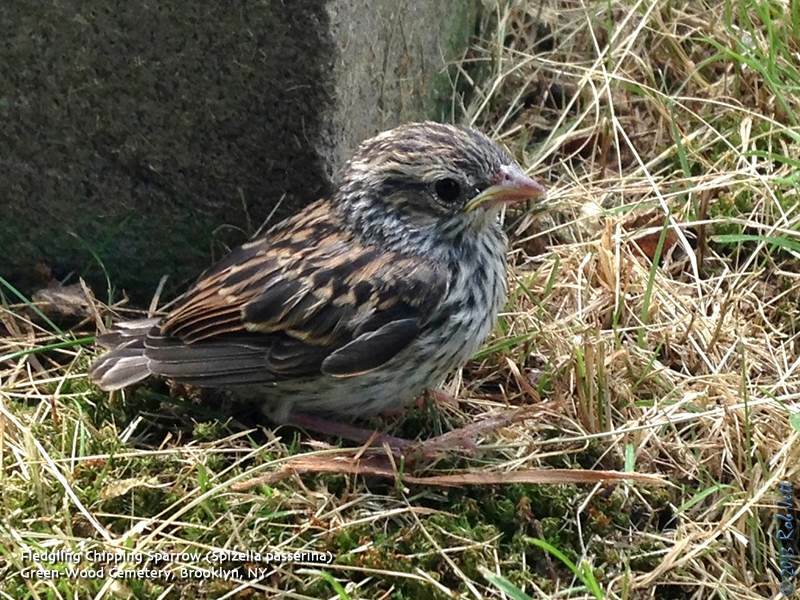 This prematurely fledged youngster was in danger of getting stepped on or run over by a lawn mover. I picked up the feisty little sparrow and placed it on a high, flat-topped tombstone where the parents immediately attended to it. 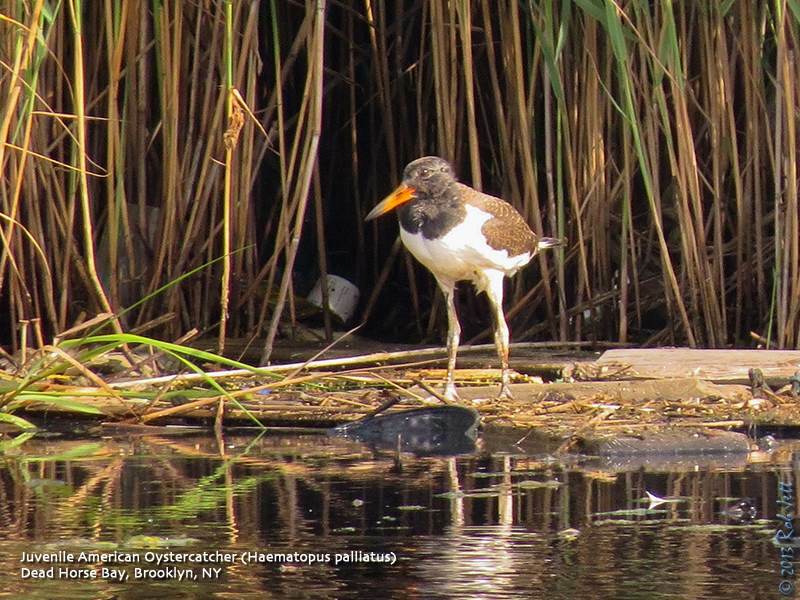 June is a very slow month for birds around Brooklyn and NYC. More specifically, for new birds. 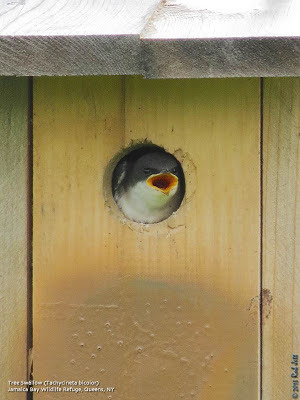 The birds that breed in our local parks and backyards are very active raising their offspring and coastal areas are noisy with nesting terns and gulls. It is rarely a time for observing new species. In Brooklyn I found a Cattle Egret early in the month and at the end of the month heard the bubbly, happy song of my first Marsh Wren of the year. Add to that the Black Vulture, Mississippi Kite and Blue Grosbeak I saw on Staten Island and I finished the month of June with 224 species for the year (218 in Brooklyn). 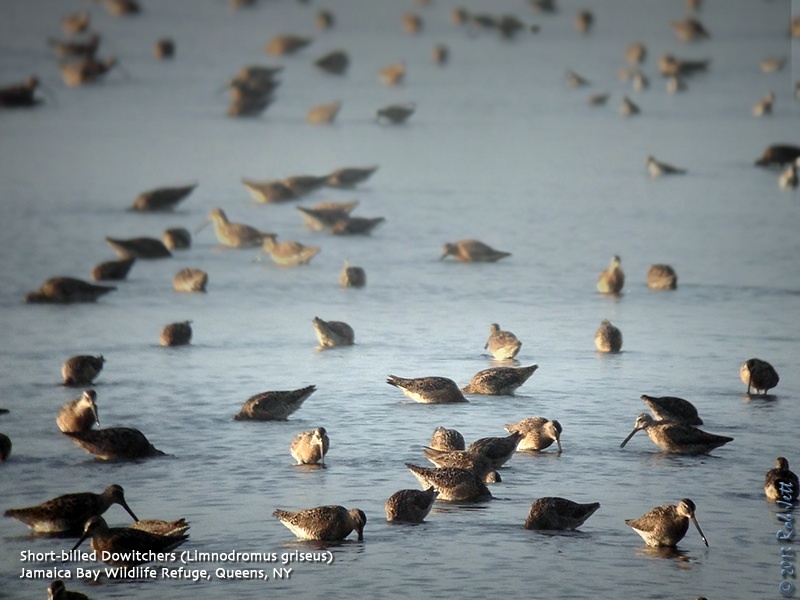 During the month of July we'll be seeing an increase in shorebird diversity and abundance as birds begin their South-bound, "Fall" migration. 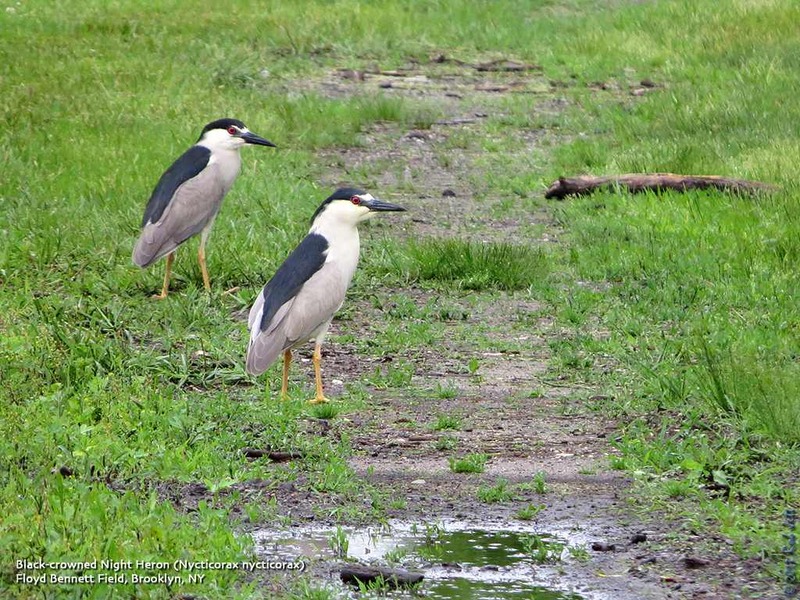 A pair of Black-crowned Night Herons out for a stroll in the North 40 at Floyd Bennett. 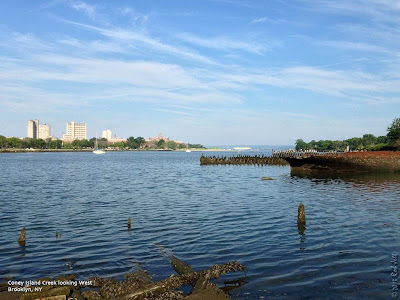 Open to members of Gowanus Dredgers 501(c)3, for experienced canoeist, this is a roundtrip voyage to / from Governors Island - reservation required. With Metropolitan Waterfront Alliance. Guide: Gabriel Willow As part of City of Water Day, a celebration of the waterways and harbors of New York City, NYC Audubon is offering a special eco-cruise past Hoffman and Swinburne Islands exploring the natural history of the area. The tour leaves from Governor’s Island. 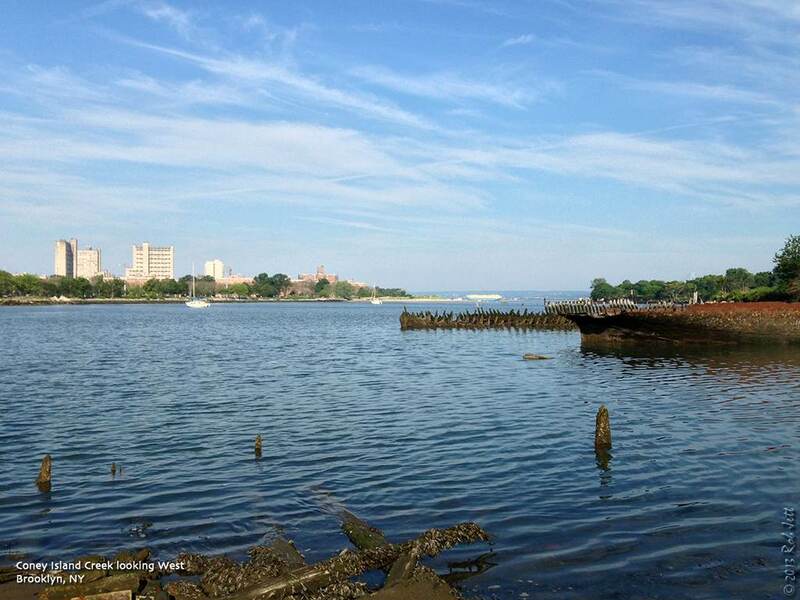 Find more info about City of Water Day and ferries to Governor’s Island at www.nycaudubon.org. Saturday, July 20, 2013, 10:00 a.m. to 2:00 p.m.
Meet at the bike path entrance on the Old Mill Road next to St. Andrews Church (the old one). We will walk along the path toward its T-junction cutting invasive vines that strangle saplings along the trail. If you don’t have your own, Protectors will supply gloves and pruners (& refreshments). After a two hour work session (our 204th monthly workshop), we will take a short walk over nearby trails. For more details call Don Recklies at 718-768-9036 or Chuck Perry at 718-667-1393. Saturday, July 20, 2013, 2:00 p.m. to 4:00 p.m.
Kingdom Pond Park, Arbutus Woods, Bunker Pond and the Huguenot Pond Park are small parks in the lower Huguenot area. Though trailing arbutus is long gone, the area still is home to a number of flowering plants and animal species. Meet along Kingdom Avenue, parallel to Huguenot Avenue above Hylan Boulevard, near the intersection of Jansen Street. Greetings. 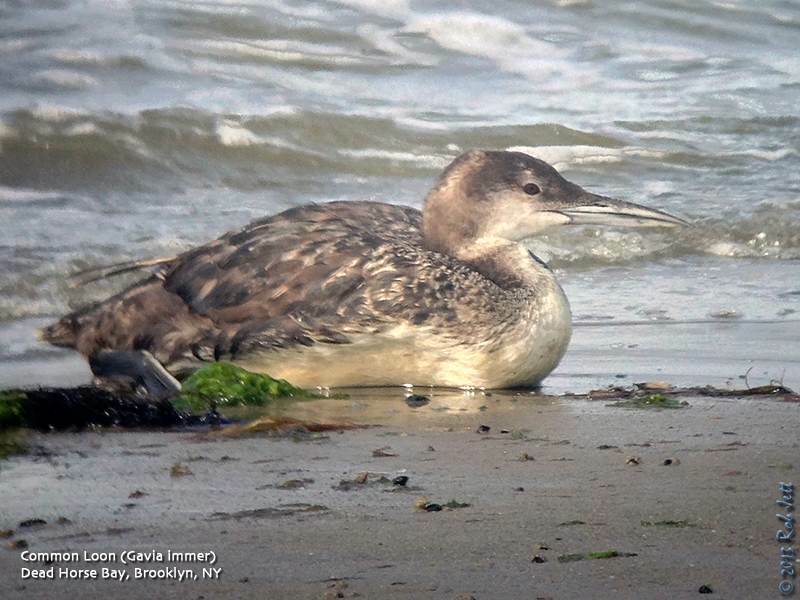 This is the New York Rare Bird Alert for Friday, July 12th, at 6:00pm. The highlights of today's tape are ELEGANT TERN, SANDWICH TERN, ARCTIC TERN, AMERICAN AVOCET, MARBLED GODWIT, BLUE GROSBEAK, and YELLOW-THROATED WARBLER. After its discovery on the flats at Cupsogue County Park in West Hampton Dunes on July 3rd, the first summer ELEGANT TERN seemed to develop a pattern, appearing three evenings in a row, from the 4th through Saturday the 6th on a sandy cove at Tiana Beach, about ten miles east of Cupsogue on the north side of Dune Road. Unfortunately with birders staked out there Sunday evening, the bird instead reappeared at Cupsogue, disappearing with the rising evening tide. That's turned out to be the last sighting, despite intensive searching during the week. It's conceivable that the ELEGANT continues in the area, but other than in the Cupsogue/Pike's area and the Tiana Beach cove (which is on the bay side just east of the boardwalk that goes east from the bay side parking lot), the only places the tern has been seen, both on Saturday, were along the south shore of the tern breeding island in the bay just west of Tiana Beach and then on the ocean beach in a large gull and tern roost, a quarter mile east of Triton Lane. So it covered lots of territory and hopefully will reappear in an area that it will be detected again. This tern constitutes a first New York state record, pending NYSARC acceptance. At Cupsogue, the RED-NECKED STINT was last seen on July 4th, but the hybrid DUNLIN x WHITE-RUMPED SANDPIPER was still there recently. A few first-summer ARCTIC TERNS continue to visit the Cupsogue flats, and interestingly, an adult also visited last Saturday and later, with another adult stopping by briefly at Tiana Beach Saturday evening. Numbers of ROYAL TERNS have been increasing, occurring at Cupsogue and nearby Pike's Beach, as well as at Tiana recently. Cupsogue has also been hosting several BLACK TERNS and ROSEATE TERNS. Shorebird migration has also been noted in that area, with a strong movement of SHORT-BILLED DOWITCHERS and LEAST SANDPIPERS for instance last Monday, and a MARBLED GODWIT was noted at Tiana Thursday, with a WHIMBREL the same day at Triton Lane. The good news is that the water level on the East Pond at Jamaica Bay Wildlife Refuge is coming down, which has already paid dividends with the appearance of an AMERICAN AVOCET on the pond on Monday. The avocet was still being seen yesterday, but has not been refound today. Other shorebirds there include some STILT SANDPIPERS, with a PECTORAL SANDPIPER as of Thursday. Please note that the East Pond conditions are not as you remember them from before Sandy, and diligent care needs to be exercised when walking the pond edges. Out at Nickerson Beach off Lido Boulevard west of Point Lookout, a SANDWICH TERN paid a brief visit to the tern and skimmer colony on Wednesday but has not reappeared since. Offshore pelagics have been few and sporadic for the most part, but better the farther east you go. A WILSON'S STORM-PETREL was spotted off Shinnecock Inlet last Friday, and a few distant shearwaters were off Tiana Beach Saturday. During the week, some CORY'S SHEARWATERS, a GREAT SHEARWATER and a MANX SHEARWATER were noted off Georgica Beach on eastern Long Island on Tuesday, with 75 CORY'S and 3 MANX reported off East Hampton Thursday. A singing BLUE GROSBEAK was at the Southport Natural History Museum in Bridgehampton yesterday morning, and the YELLOW-THROATED WARBLER was still singing near the entrance to Connetquot River State Park on Saturday. For the next two weeks the Rare Bird Alert will be handled by Tony Lauro, so please call in your reports to Tony at (631) 734-4126. Most people are aware that the oceans aren't doing so well, but what is going on exactly? 'Losing Nemo' is a six-minute, 3D-animated film about the state of the oceans. The film is the result of months of work by a group of creatives from around the world. They worked on it in between projects that pay the rent. It is our message to the world that we are serious about applying our art to contribute to a better world. Rescheduled from June 8th 2013 Guide: Gabriel Willow Meet at Grand Army Plaza. 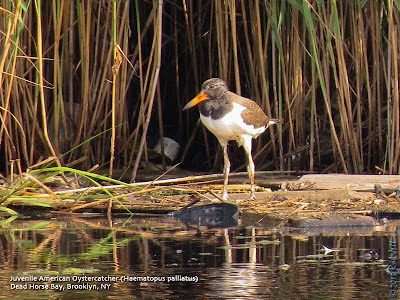 Bike your way through Brooklyn neighborhoods and along scenic greenways to Jamaica Bay, to look for migrant shorebirds as well as breeding egrets, oystercatchers, and more. This is a 1-mile trip; return by subway from Broad Channel. Bring binoculars, water, lunch, and your bicycle. Limited to 15. $30 Click here to register. Saturday, July 13, 2013, 2:00 a.m. to 4:00 p.m.
During a 1.5 mile hike through the woodlands of Long Pond Park, we will look for evidence of the geologic history and human influence on the park as well as observe wildlife of the park. Reptiles such as painted turtles and garter snakes and amphibians, including Fowler’s toads and bull frogs are often observed here. Meet at Public School 6, on Page Avenue and Academy Avenue, three blocks northwest of Hylan Boulevard. Sunday, July 14, 2013, 9:00 a.m. to 11:00 a.m.
NRPA, the Natural Resources Protective Association will meet at the corner of Goodall Street and Tennyson Drive for an extended visit to Crescent Beach (north and south), Seaside Nature Park, and the tidal marsh property adjacent to Great Kills Park located at the corner of Fairlawn Avenue and Mansion Avenue. For more information call Jim Scarcella at 718-873-4291. Bring a water bottle and snack. 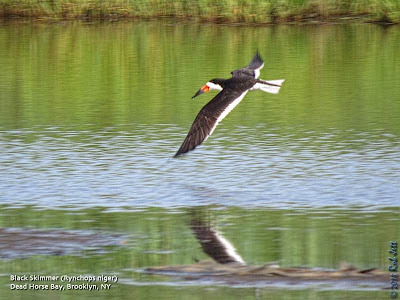 Join us for biking and birding along Jamaica bay with Don Riepe of the American Littoral Society. The tour will make various stops along the Jamaica Bay shoreline to explore the natural wildlife and ecology of the area. Tree Swallow nestboxes ring the path surrounding Jamaica Bay Wildlife Refuge's West Pond. 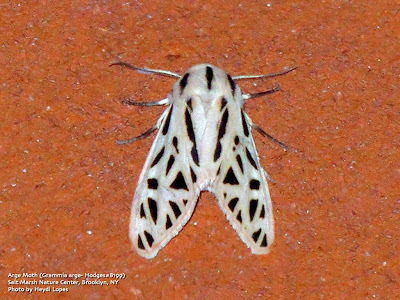 These acrobatic insectivores are also know to eat plant food to help them survive cold snaps. Their wintering grounds are as far as southern Central America.